Complètement amélioré 2BD w. Ski-in, ski-out accès au Sommet Tyra! À l’intérieur du condo se trouve un aménagement spacieux et ouvert qui pourra accueillir confortablement six personnes dans ce condo de deux chambres à coucher. Il y a un grand hall pour le rangement, menant à l'immense salon. Dans le salon, vous trouverez des canapés confortables entourant une cheminée à gaz et une grande télévision à écran plat. Juste à côté du salon se trouve la salle à manger avec de nombreux sièges pour toute la famille. La cuisine est mise à jour avec des accents de journal et des comptoirs en granit et est entièrement équipée avec tout ce dont vous aurez besoin pour préparer tous vos repas. La chambre principale est ouverte et spacieuse avec un lit queen confortable. La deuxième chambre est grande et invitante offrant deux lits jumeaux pour les arrangements de couchage multiples. Le condo est situé au deuxième niveau, ce qui en facilite l'accès pour tous. Il possède un grand pont arrière donnant sur la piste de ski pour une détente après le ski de qualité. Ce condo est livré avec 1 place de stationnement dans le garage de stationnement couvert. Great floor plan! Kitchen is very nice and is well stocked with pots/pans/etc. We loved the ski in/out ability! We will definitely come back! The best place to stay for ski in ski out!! This unit was all around perfect for a long weekend in Breck. I have stayed in other houses/condos that claimed they were ski in ski out, but out of all of them, this was the easiest as far as skiing right up to your condo. The unit was clean, the resort managers were quick to give us a parking pass when we originally thought we wouldn't need one, and the view from the back balcony was beautiful. Uber came and went from the condo to take us anywhere we needed to go. The ski rack right as you walk in the unit was extremely beneficial and helped us keep the unit dry from melted snow. If you are on the fence about staying here, I highly recommend it. Overall it is a great property. Had a wonderful time! The condo is very nicely appointed and very clean. Has most everything you need for making meals. The dining table is very large and allowed us to host friends for dinner, that were staying in Breck that week. We aren't used to the dryness and should have run the humidifiers that were in the closets. Also, we turned the heat completely off and it was a very comfortable temperature! There are thermostats in the bedrooms and the in the main hallway. We were there the week of Dec 9th and unfortunately this year 4 o'clock run was not open till Thursday of that week - a very warm fall this year, so no ski in till then. Our Family enjoyed our stay at Tyra . The unit was very comfortable and the location was excellent. We look forward to returning next year. 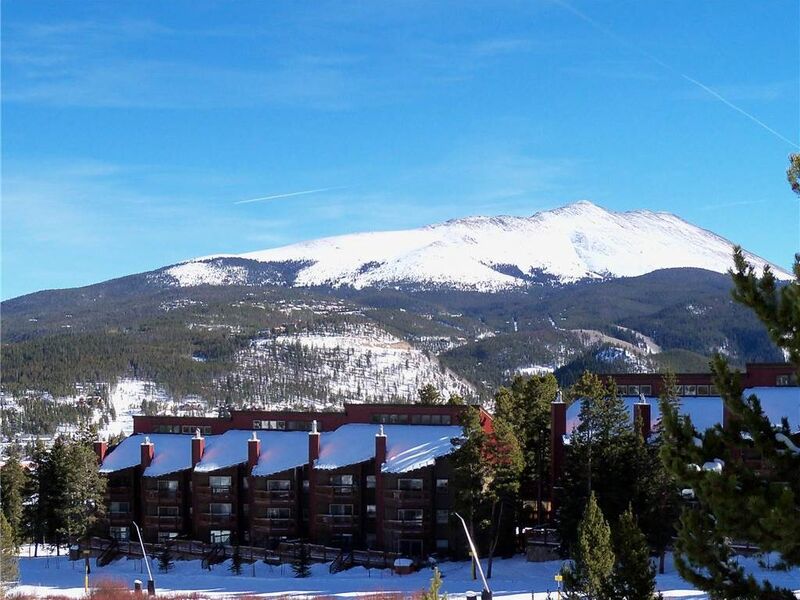 We travelled in from Houston to ski at Breckenridge Jan 22-26, 2016. The condo is a bit difficult to find especially at night - get good directions - the building letters are hard to see. The family room and kitchen are very nice, roomy and have a nice view of the 4 o'clock run and mountains. The kitchen is well equipped with plenty of dishes, pots, pans, coffee maker, basic spices, etc for cooking. The bedrooms are comfortable but the twin bedroom is very cramped - difficult to maneuver around the beds because they are so close to the dresser. Bathrooms are both very small - not what I expected for the master bathroom for sure - more like a half bath size with a tub/shower - single sink with little counter space. The antler chandelier in the family room needs to be raised up - both adults hit our heads on the chandelier while there - anyone 5' 10" or taller will have this problem (I'm 5'10"). There is no way to access the condo complex elevator without going up stairs - this is important to know especially if you are carrying luggage/ski gear. It is a weird layout for the condo and the elevator is in a bad location and not easily accessible. We ended up hauling our stuff up 6 flights of stairs from the garage level instead of walking all the way to the elevator and at that, having to go up stairs to access it. Not the easiest thing in the world esp with the gear and the altitude (and we are in good shape!). This should be disclosed in the property description. The garage is very tight but nice that it is covered (not heated). The "true ski in / ski out" convenience is more of ski in - kind of ski out. You can ski in to the back of the complex via 4 o'clock run - again you'll have to haul your gear back to your room - stairs are involved even if you use the elevator part way. "Ski out" is ski down to the road; take your skis off; walk across the road and climb the hill to the Snowflake Lift and put your skis back on. Not a huge deal but not a TRUE ski out. The free "private" (sometimes shared with others at other properties) shuttle to town from the condo was nice for evenings out - and they were fairly prompt.